We get a lot of people ask us how we can brush their dog and cat so easily and remove some much dead coat and knots. It’s not really in the brushes themselves its all in the technique. Most people have the tools needed, they just don’t know how to use them to their full ability. First things first. You need to get your dog on a high space such as the washing machine or a table and put something no slip under them. Being up high they know that it is brushing time and not play time. This is especially important in cats and puppies. If help is needed to distract your pet then get a family member in front of them with treats and praise. With a cat, wither you or your helper must put slight pressure on the cats shoulders so they stay still and relax for the groom. Do not expect your pet to love this straight away. It needs to be a routine that eventually your pet will enjoy the attention. Waiting until your pets is already knotted will make your pet hate grooming. I find a lot of dog owners own a slicker brush (with the sharp hard or soft pins), but no comb. 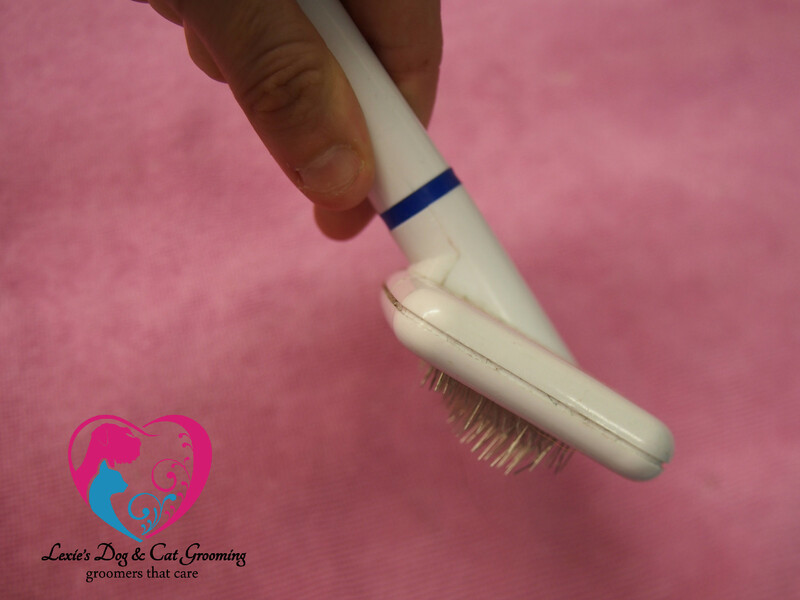 For the best results and with little coat damage it is best to use a soft slicker for the first part of the brushing. You should not use a slicker brush on a cat unless it is very soft cat brush. You must be careful the way you use these brushes, used incorrectly they can make your pet hate brushing as you are scratching their skin and pulling too much hair at a time. The best technique is line brushing. This is what we do before we clip your dog. We need to separate the hairs in order for the blades to get through and you should be doing this at home to let the skin breathe and prevent matting. 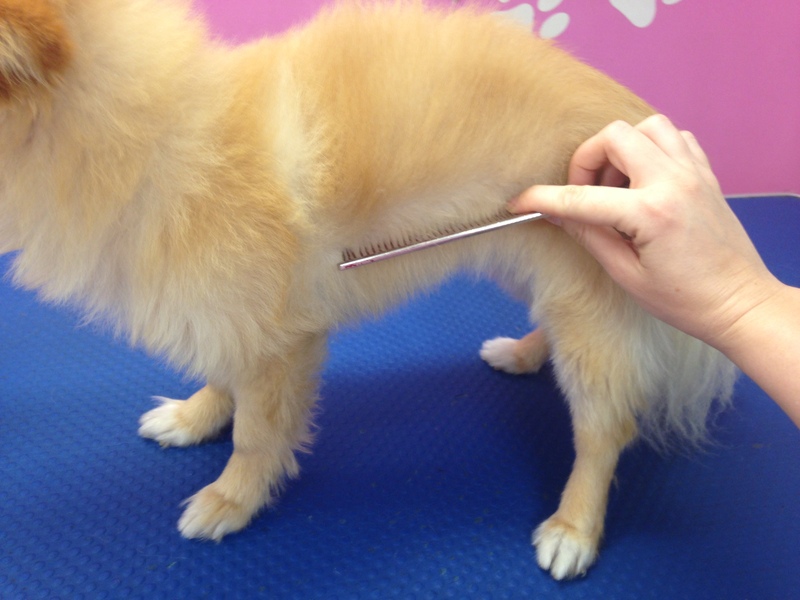 To start brushing your dog you must start in one section of your dog, whatever is easiest for you. I like to start from the back foot and work my way to the head, or for cats, from the base of the tail to the head, then underneath once they have settled. Line brushing includes holding the fur down, holding the brush on an angle, using a flicking motion so your brush is brushing the coat and so that the pins are not scratching the skin, only just grabbing the fur.. This way you are getting all the way down to next to the skin. The correct way to hold a slicker so you may easily flick the brush. 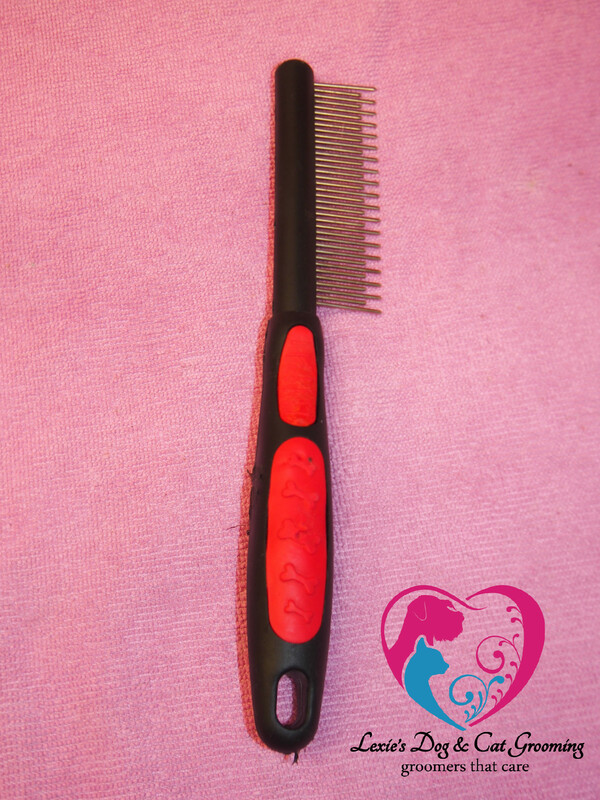 After using a slicker or pin brush you may go to your comb to check the coat for knots and tangles. In double coated dogs or cats you would go for a shedding comb, other long haired dogs (over half a cm) you would go for a double sided comb. 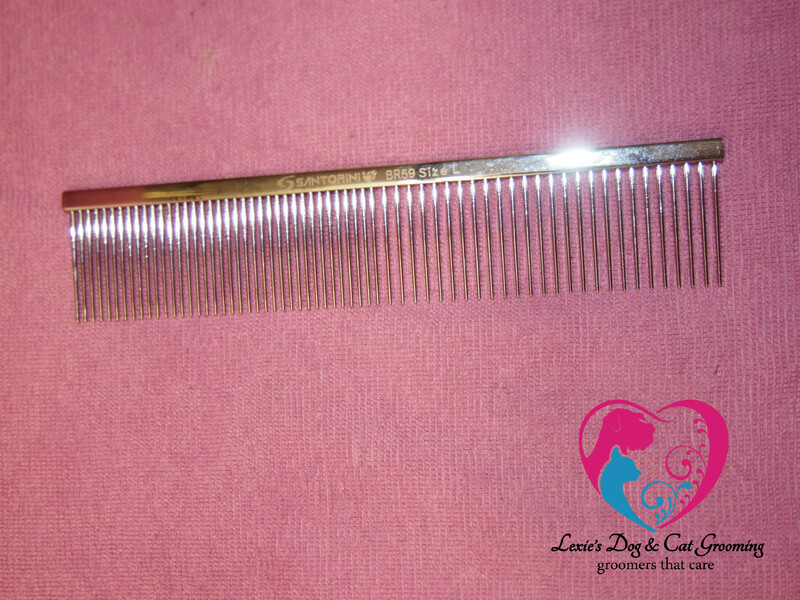 Double sided comb, use the wider teeth to comb out small tangles, and the finer teeth to check areas such as the ears, tail and face. Shedding comb used on a 45 degree angle in a line technique to remove undercoat and small knots. 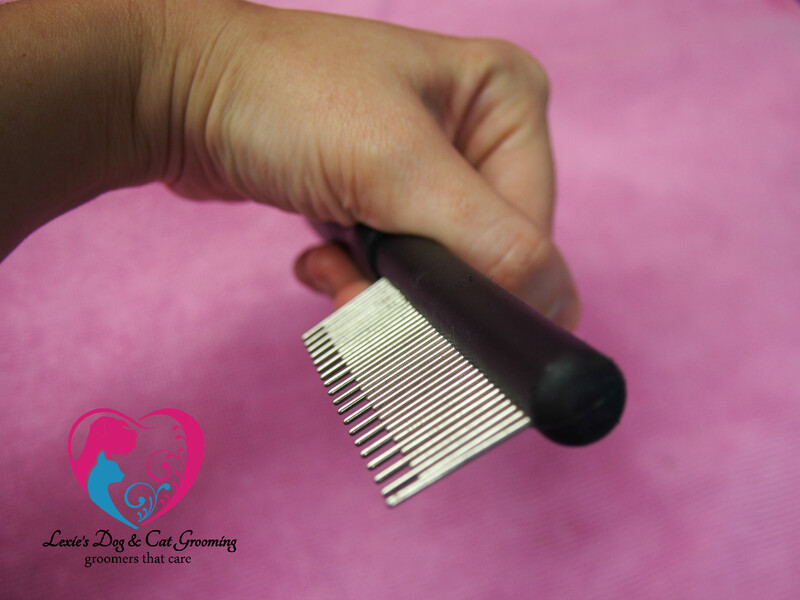 To comb the ears and tail of long haired dogs (and tails on cats) I fan out the tail and ears so I can separately comb each part so no spots are missed. Remember combing and brushing your pet is important for coat and skin health, removing dander and undercoat which will be in your carpet and house. Here is a video from an American Groomer that shows the technique that all good soft groomers use. For Short haired pets we recommend a furminator or rubber curry brush. All of these tools are available for sale at our salon. Ask us to show you how to do this in person. I hope this helps you and your pet enjoy grooming time.